You may have noticed my absence – no blog posts for a couple of weeks. Originally I intended to write whilst I was on holiday, but the scenery and the knitting and crochet was all too tempting and so I spent my time gazing at passing fjords, knitting socks (three in total), crocheting a hat and scarf for Auguste, crocheting the beginning of a long-planned lap blanket, eating amazing food and strolling round a variety of coastal towns along the coast of Norway. Mr Snail kept those of you who follow his blog or Twitter feed updated occasionally, but mostly the computer remained only a slight distraction. I was delighted to return to a country where knitting is such a normal part of life. On board ship I was able to observe the knitting of socks, hats, mittens and larger garments. I only saw one other person with a crochet hook, and all the knitters were using either circular or double-pointed needles. My Norwegian being non-existent, I didn’t feel comfortable approaching anyone to talk yarn, but I was delighted to discover from the lady in a fabulous wool shop in Tromsø that Norwegian yarn is much more readily available than when we visited in 2013. As in the UK, there is increasing recognition that local yarn should be valued. 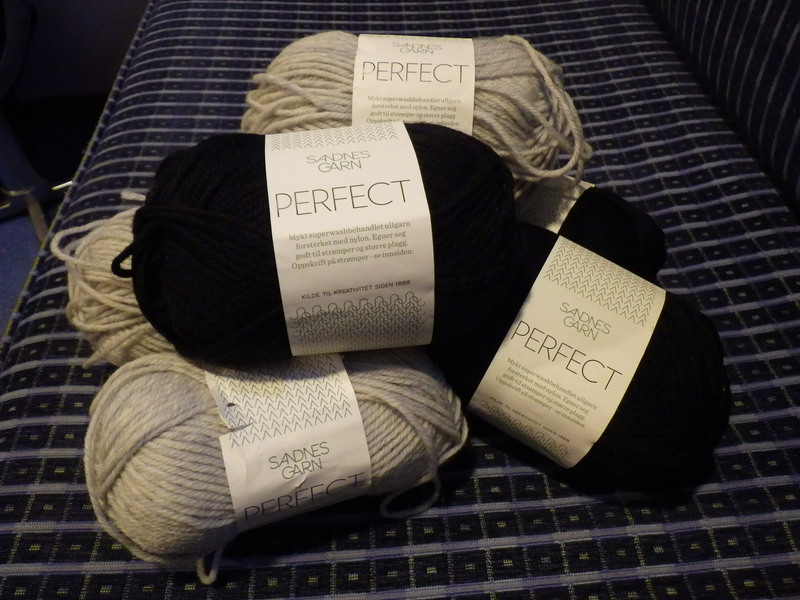 So, unlike last time, I was able to purchase some REAL Norwegian sock yarn… and delighted to be told that the shop will happily send me more if I didn’t buy enough. They do have a website, although it’s only partially translated into English – for which there were many apologies and a promise of improvement over the summer (oh, the shame of being an Anglophone and living in a world where there is some sort of expectation that everyone will pander to us). I now just have to find a traditional sock pattern that I like to have a go at. I’ll share my accomplishments in a future post. I have pleasant memories of Norway – camping in -40C! Northern lights and lots of food! This time it never got below freezing or went dark… when we were there in 2013 I think it never got above freezing and it was dark/dusk almost all the time. What a contrast! What an amazing place. It does… although I may be stressed again by Friday as I’ve now got the builders working on the new conservatory. So far, no builders have been harmed during the construction work… at least, not by me! I’m taking it a day at a time… I loathe having work done in/around the house, so it’s taking some effort not to get stressed. However, the person who owns the company doing the work is very good, thoughtful and helpful, so does seek to minimise disruption. I think that I really will have to buy an orange tree… in a month or two, perhaps! My great worry about taking a cruise holiday has always been that I’d be afraid of getting rather bored. Clearly a spot of handwork is completely acceptable to take care of that problem. I hope you have some scenery photos to share – I only ever managed to get as far as Denmark for 2 days on a business trip, but I would have loved to see the fjords. Glad you’re back, you were missed! A real case of sitting back and letting someone else do the driving while you knit!! Like Kate I would love to see some scenery photos. I had a Norwegian pen friend as a child. That’s the closest I have ever been to Norway. It must be wonderful and sort of affirming to see all that knitting going on. Thanks for the update! It’s all about numbers and the world of commercialism. If all the English speaking people lived on one little island and the rest of the world spoke Norwegian then the English speaking population would need to become bilingual…especially if they needed to sell their products worldwide. Wow, you did all that knitting. And judging from the final photo it also included complex patterns. For myself, I would probably have just fallen asleep to the gentle movement of the boat and fresh sea air. Picture me lying back in a deck chair, eyes closed, mouth open, industriously sleeping. Glad you had a great trip. How wonderful to feel at home with so many other knitters. It crosses language barriers somewhat. Lovely that you took the time to truly enjoy and relax. Welcome back! Sounds like you had a fabulous and productive trip. I’m with you on the whole ‘having builders in’ thing – I do hope it goes smoothly and quickly – and great advice from thecontentedcrafter – “focus on next year”! Oh yes, some pictures coming soon… so many to choose from! A boat trip in Norway sounds amazing! Who knew cruise ships were such hotbeds of knitting?! No worries on missing a few posts–esp for such a fabulous reason! Taking time off the grid is always great. You can come back fully recharged with new ideas/energy! How lovely to find so many other ladies knitting! I am so pleased to read of your trip and of your sweet travelling companion (s). Had not better leave out Mr Snail!